It was 20 years ago today that Microsoft released Windows 95, thus forever changing the computing landscape. I had just turned 13 and although it’d still be nearly half a decade before I got my first computer, I can still remember the occasion as if it happened yesterday. In the summer of 1995, I was a diehard console gamer. By that time, the Sega Genesis and Super Nintendo were mere decoys to keep me occupied until the Sony PlayStation arrived in December. The Nintendo 64 was still more than a year out. I’d heard a lot about Doom and Myst for the PC but had only spent a brief time with the latter at my cousin’s house. Why am I carrying on about video games in a story about Windows? Because at the time, high-profile video game releases were the only thing even remotely comparable to the warm and chaotic welcome that Windows 95 received. Buying a highly anticipated game in the mid-90s involved placing a pre-order at your local Electronics Boutique, Babbage’s or Toys “R” Us. Come launch day, you’d simply head down to the store and pick up your copy of said game. Depending on the title, it wasn’t uncommon to have to wait in line which only further fueled the anticipation. The launch of Windows 95 surpassed anything I had previously seen. I recall watching multiple news reports showing hoards of people clamoring to get their copy of the OS at midnight launch parties across the country. Again, I knew absolutely nothing about computers at that point but even as a young teen, I was fully aware that I was witnessing history in the making. Windows 95’s rich graphical user interface and icon-laden desktop as well as features like the Start Menu and task bar were concepts that made computing much more approachable for the average Joe. The OS also marked the shift from a 16-bit to 32-bit architecture and its plug-and-play nature was welcomed by all. Just how big of a deal was it? One computer consultant at the time told The New York Times that Windows 95 was to computing what color TV was to black and white TV. He was right. Microsoft has certainly stumbled along the way yet to this day, its software continues to power the overwhelming majority of the world’s computers. Had Bill Gates and company not found success that summer, the entire computing landscape – and our love affair with technology – would no doubt look drastically different than it does today. Windows 95 was already old news by the time I got my first computer although those a bit older than me will no doubt have fond memories of it. 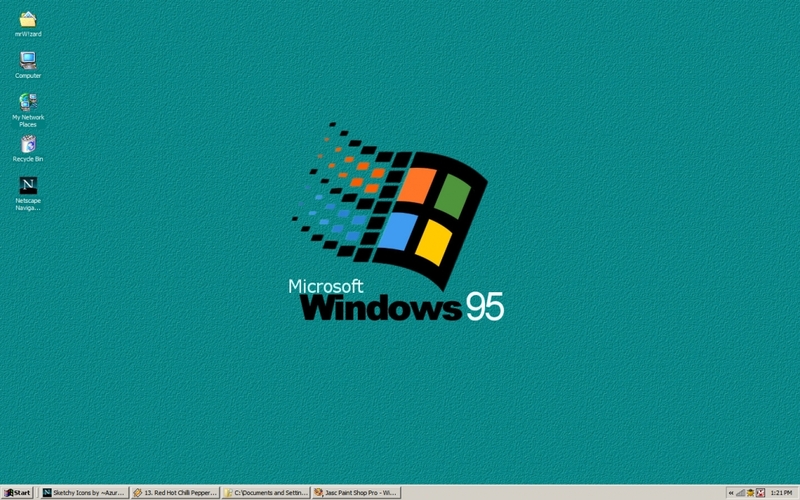 Feel free to share what you remember most about Windows 95 in the comments section below!